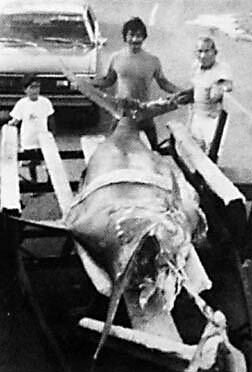 James Celestino was 12 miles outside of the Kahe Power Plant when his 1,050-lb marlin ate a lure behind his boat, the LAURA LEI. James was alone on the 17-foot Glass Pros boat and the fish was hooked on 150-lb test Ande line spooled on a 14/0 Penn Senator reel. James fought the marlin for two hours and 19 minutes using a 130-lb class Daiwa rod in a shotgun rod holder.